There have been so many articles about creatine on the Internet that I usually hesitate to add another one to the (mostly accurate) praise of creatine monohydrate. The reason I still want to address the issue today, is a quantitative one: The data Kebrit and Rani present in their recent paper in the Turkish Journal of Sport and Exercise is simply too impressive not to (ab? )use it as a plug to remind you that you are missing out if you don't use 3-5g of creatine to speed up your strength gains - if you are a beginner by a whopping 100%! Creatine + ALA = Better Uptake? Creatine Before or After Workouts? The study design Daniel Kebrit and Sangeeta Rani, two scientists from the Debre Markos University and the Haramaya University in Ethiopia used in their study is easy to explain. 20 Ethopian sprinters (no master athletes) who competed to represent Haramaya Universityin 6th Ethiopian Higher Education Institutions sport festival completed a 12 weeks of resistance training program with or without provision of 5g of creatine per day. "After two weeks of conditioning, the groups were begun performing resistance training (both weight bearing and weight free exercises). Weight exercises include deadlift, barbell squat, bench press, etc. Push up, curl up and brisk walking were some of the weight free exercises which were performed by both groups. If you take a look at the type of exercises, the workout frequency an the total volume (in minutes), you may be surprised that this was enough to elicit the strength gains I plotted for you in Figure 1. Figure 2: comparison of the relative increase in bench press strength in response to creatine supplementation (Kebrit. 2013) and testosterone enanthate (Bhasin. 1996) both in conjunction w/ exercise. I am not kiddin't this is steroid like! I know it sounds hilarious, but if you look at the results of the often cited study Bhasin et al. published in the New England Journal of Medicine on the 4th of July in 1996, you will see that the even a supra-physiological dose of injectable testosterone enanthate did not double the gains of the young, healthy study participants in the said study. It's an apples vs. oranges comparison, I know, but it's still impressive, right? 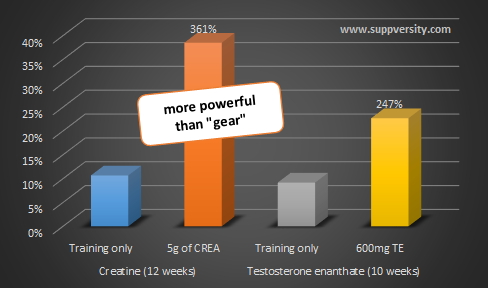 Well, I thought so and that's why I did include this study in the SuppVersity news, although each of you should know that creatine and protein are the only two "must have supplements" for strength trainees. Bhasin, Shalender, et al. "The effects of supraphysiologic doses of testosterone on muscle size and strength in normal men." New England Journal of Medicine 335.1 (1996): 1-7. Kebrit, Daniel, and Sangeeta Rani. "Muscle strength and muscle endurance: with and without creatine supplementation." Turkish Journal of Sport and Exercise (2013).